Watching fireflies in a hidden Kiwi grotto with an elderly bus driver. Hearing insects mimic zipwires deep in the Laotian jungle. Standing knee-deep in the Ganges at sunset. Chinese tourists queuing up to take photos of my friend and I at a national park. Shifting rocks by hand from a landslide-covered road in the Peruvian mountainside before our bus could continue its journey. My strangest travel memories aren’t necessarily the most enjoyable (nor by any means the least) but they stand out for other reasons; mostly being accompanied by vividly sharp snapshot-like recollections, many years after the event. Although the route is sadly now defunct, my ferry trip to Shanghai remains one of the journeys I’m most glad I took during my year living in China. And, if not the strangest, it’s certainly the longest “moment”, lasting an afternoon, a day, and two nights. Dalian is a major Chinese port city, which sits on the tip of a peninsular jutting into Korea Bay, just 180 miles from the North Korean border. Like many Chinese cities, it’s not much of a looker, although it does contain the largest city square in the world (which we didn’t visit). As with certain British cities (which shall remain nameless, for fear of online persecution), we had arrived with the the primary intention of leaving. We were en route to Shanghai, and intended to arrive by boat. I don’t remember where we bought the tickets or who first discovered that this route was a possibility but I do recall the uncountable mass of gloomy passengers waiting to board – with us the only Westerners – and it occurring to me that we looked like downtrodden refugees being herded on to a container ship bound for god knows where. We were dwarfed by its bulk, ants swarming the hull, and as we shuffled in single file up the gangplank I glanced to my right and noticed a gaping hole, rusting and ugly. The only consolation was that the ship had clearly made several journeys with such an injury and as yet remained unsunk, so it would surely survive another. Besides, we’d taken a Chinese plane some months before which had duct tape sealing a gap in the cabin’s interior wall so, you know, perspective. Travel classes were similar to those on Chinese trains: we chose the equivalent of “hard sleep”, which got us each our own bed in a four-berthed shared cabin, with – somewhat luxuriously – a door. Above us were the private cabins, in several levels of plushness; below, the communal bunks in one huge room, and below that were the berthless passengers. These people had paid merely for passage but brought their own sleeping paraphernalia and, immediately upon boarding, had set up camp in every square inch of space. It was a mission not to trip over the ubiquitous bamboo sleeping mats, found in the bathrooms, outside our rooms, under the tables, on the stairs, spread throughout the ship in a quest for colonisation. I was in China through the gap year organisation Project Trust, teaching English in the south, and this journey occurred during the Spring Festival holidays. Although PT mostly sends its volunteers to the four corners of the earth in pairs, we were at this point a group of seven, although I can’t recall why the eighth member wasn’t there. What I do remember is that we were allocated our bunks in such a way that one cabin held four friends, another had two (sharing, if I’m not mistaken, with a pair of senior officers from the Chinese navy), and meanwhile I was unceremoniously shunted into a third cabin, all on my own. Well, not entirely alone: I got to share with three chain-smoking Chinese men. Their English was non-existent and my Mandarin was mostly limited to haggling over the price of tomatoes, booking hotel rooms, and proclaiming “but I’m a student teacher” for favourable entry fees to tourist attractions. As such, the conversation ran dry very quickly and they resorted to lying on their beds and staring at me with a mixture of reproachful curiosity and utter impassivity. And all the while they sucked on the deadly unfiltered cigarettes so popular over there, quickly filling the airless cabin with putrid smoke as I, asthmatic and on the top bunk, struggled increasingly to breathe. This would never happen on P&O. Thankfully we weren’t confined to our cabins and as such I was able to hang out next door. This was pre-smartphone, and nobody travelled with a laptop then, so the time was whiled away with conversation, card games, Gordon’s surprisingly effective method of teaching basic drum beats by slapping one’s thighs, and book-sharing. Most travel foods in China are themed around variations of the pot noodle. Whether taking a short bus or four-day train, travellers hump around glass jars of tea leaves, boxes of home-made ingredients or – most often – shop-bought “cup noodles” and their various brethren, all of which require hot water. On trains, a flask of recently-boiled water is provided and frequently replenished, and even the cheapest hotel rooms have easy access to this culinary essential. But not the Dalian-Shanghai ferry. Here, hot water was to be accessed from what I suppose was a tank – a boiler – an ugly metal contraption with pipes disappearing into the wall, some six foot square, with two taps and a dial in the middle which indicated the current temperature. On our first day, I was dispatched to collect water and off I duly trotted with flasks in tow, expecting to find a small water heater at the end of the floor, as it was in hotels and public buildings. Instead, I eventually located this massive beast, surrounded by a scant crowd of hungry-looking people bearing containers and peering fixedly at the central dial. The little arrow appeared disconcertingly low, if one considered its location with regards to the Chinese character which presumably meant “water boiling, use now”. It won’t take long, I thought, considering the short amount of time it took for the shower to heat up back home. I gazed at the dial. It didn’t move. Minutes passed. More people joined us. We all eyeballed the tiny centre of our universe. If a watched pot never boils then this was a surefire disaster. After half an hour of standing and gazing, the crowd had increased almost exponentially, filling the corridor where the boiler was located, shifting from foot to foot in almost total silence. The only chatter seemed to come from those who had located me near the front of the semicircular gathering and were questioning the appearance of this young, yellow-haired woman, queuing for water; most unusual. Utterly baffling. And yet, it proved just how essential this water was; in similar situations, people had abandoned whatever they were doing to stop and gawp, touch my skin, laugh in my face, or take a photo. One time a man was so astounded to see me and Lisa simply walking down the street that he cycled straight into a bush. That nobody really seemed to care about my existence spoke volumes. And we all continued to stare and the tiny dial shook and we took a collective gulp of air as it hovered and moved a few millimetres. I waited perhaps as much as an hour for the water to reach boiling point. I was lucky; those of us at the front filled our flasks and the others, elbowing forward, watched dismally as not only the temperature but also the pressure indicator dropped and realised that the whole sorry saga would have to be repeated until it was ready once more. I already knew how grateful I’d be for clean water from a tap when I returned to the UK – we couldn’t drink the local water in China, and boiled everything first, even to clean our teeth – but now I would add to my list of gratitude the luxury of waiting a mere three minutes for the kettle. I’m under no illusions; an hour is still nothing compared to the obscene lengths people in some countries still wait and travel for clean water; and this, at least, would be perfectly potable once obtained, not drunk out of a nervous necessity. But that memory is like a photograph, silently standing with my fellow passengers for what seemed an eternity, all – quite literally, hah! – in the same boat, watching the slow creep of the arrow, after the same prize, nothing separating us, and nowhere else to be. I returned, triumphant, to the cabin, to friends who wondered where on earth I’d been but weren’t overly bothered because they’d been playing Spit and had forgotten what time I’d set out anyway. After that, the journey was uneventful. We arrived two days later into Shanghai’s port in the early hours of the morning. As we emerged from the terminal, the sun was breaking over the horizon, and we trooped with customary backpacker exhaustion over the Garden Bridge. I knew so little about the world then (to be honest, I know very little more about it now), although clearly we were all as ignorant as each other because when one person said “look at that!”, we all turned and discovered to our simultaneous amazement that Shanghai had the most incredible city skyline, which previously we hadn’t known existed, but at that precise moment was perfectly framed by our location on the bridge. And we were gazing upon it for the first time, in the middle of the river, glinting in the golden light of early dawn, something we’d perhaps never have seen had we arrived by plane, or bus, or train. We took a moment, breathed it in, and moved towards our crumbling hostel. 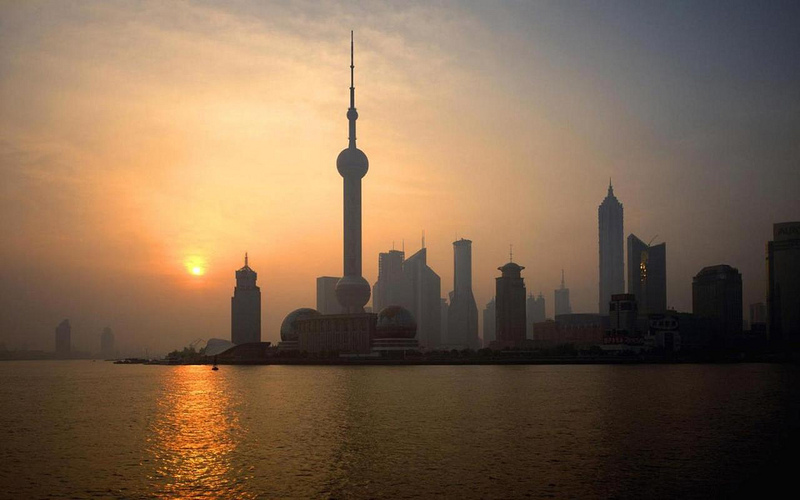 We had chosen the Pujiang Hotel to act as our Shanghai base, for its cheapness and historical atmosphere. In a previous life it had been the Astor House Hotel, an early relic of Shanghai’s grand colonial past, although long since fallen victim to the ravages of time. Most of the decor remained unchanged, if decaying, and by the 90s it was favoured solely by the occasional unfussy backpacker on a budget. Our stay in 2004 was unintentionally opportune, since it took place during what were to become the hotel’s final months of decrepitude. We would have been some of the last penniless backpackers to stay in that empty behemoth; to walk through the dust-filled stillness of the gloomy panelled corridors, sleep in the uncommonly heavy beds pushed against mildewing historic walls, roll bottles across alarmingly sloping floors, and cautiously avoid the ancient claw-footed bath with questionable stains. In a country obsessed with cheap newness and uniform modernity, especially when it came to the provisos made for foreign tourists, this place was, perhaps, unique. By the end of the year, the developers had moved in and begun the transformation to its current state: an apparently glorious, charming, gilt-edged choice for the discerning traveller, renovated to its former glory. They even found valuable antiques hidden and forgotten in the walls, perhaps in the very room were we’d stayed. But I’ll never forget the sensation of staying in what resembled an abandoned Victorian asylum, nor the spooky silence of the upper floors, and the time I wondered whether the figure I had taken to be a staff member disappearing around a corner truly was of this earth. If I return to Shanghai, I might visit the current-day Astor House Hotel. Or perhaps not. Much like my memories of the now obsolete ferry, I’d rather like my dusty recollections of that place to remain just as they are.